1) RATED #1 FOR COMFORT & PERFORMANCE: Enjoy TRUE, medical-grade compression with the softest socks you will ever wear! Clinically proven to reduce swelling, MAXIMIZE blood flow and speed recovery time! 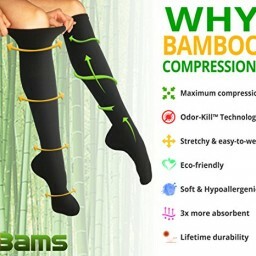 2) SUPER ABSORBENT BAMBOO: Our socks are soft as SILK yet absorb 3X more than cotton/polyester socks. Say goodbye to toxic exposure of cotton/polyester chemicals used in the textile industry that irritate your skin! Our eco-friendly fibers are grown with 40% LESS WATER than cotton with NO pesticides/chemicals! 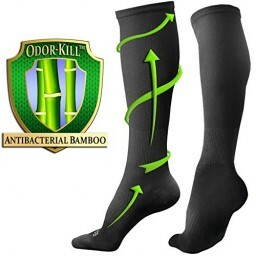 3) NEW BAMBOO ODOR-KILLTM TECHNOLOGY: Finally, odorless feet all day long! Our EXCLUSIVE Anti-Odor fibers instantly STOPS bacteria/fungi for a 99.9% microbe reduction to your legs and feet! 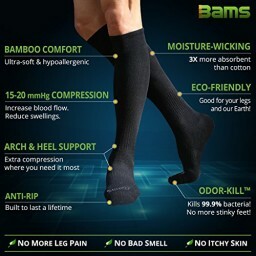 4) PAIN-RELIEF FOR A GREAT VALUE: Instantly relieve pain from plantar fasciitis, varicose veins and edema with the ONLY medical-grade, hypoallergenic compression. Prevent DVT and reduce swelling from prolonged standing/sitting. Clinically approved bamboo BEST for sensitive skin, allergies, nurses and expecting mothers! 5) LASTING DURABLITY: Our double-stitched socks have been officially tested to maintain its compression pressure, softness and strength wash after wash!